My entrance painting to the first Tauranga City Art Gallery's Miles Art Award (below). Meditations in White. 70cm x 30cm. 'HUNTING GANNETS' 60cm x 40cm. I loved playing around with these 'part-in/part-out' the water scenarios. In each painting the Gannets and the Seal are creatures that inhabit both domains, living out of but hunting in the ocean, so they made perfect subjects for this theme. 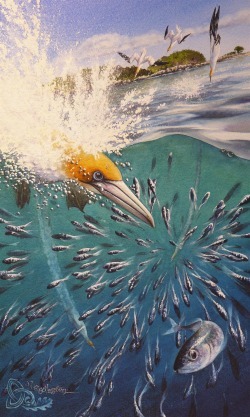 In "Hunting Gannets" (above) I tilted the horizon to add impact to the dynamics of the dive. If you look through the silver flashes of the escaping fish you can spot another pair of birds with their torpedo contrails. I can watch Gannets dive for hours. 'BENEATH PILOT BAY.' 70cm x 20cm. 'THE SINGING TEACHER' 40cm x 20cm. Inspiration for 'The Singing Teacher' (LEFT) came from 'The Magpies' by New Zealand poet Denis Glover. This Australian Magpie was the perfect subject for a painting. Stood on a wall next to the table at a cafe waiting to raid the remains of my muffin. He earned every crumb for this shot he gave me. The two paintings below were part of a collaborative project between 12 writers and 12 artists here in Tauranga. Each artist was paired with a writer. The artist gave their writer a painting for them to produce a piece of writing as a response. Then the writer gave their artist a seperate piece of writing for the artist to paint a response to. It was an interesting project as it pushed you out of your comfort zone and forced you to look in new directions. 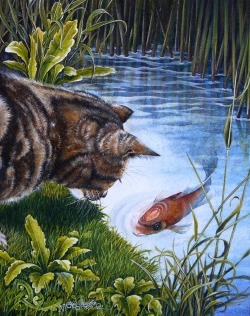 The "Conversation", with the cat and the fish was the painting I gave my writer to respond to. "Mean Streets" was my response to her writing.... a poem about fear, insecurity and vulnerability: the car's big front grill together with the yellow lighting, shags in a bar (we all know what they're like after a few beers!) and the strange sillouette of the guy all add to the feeling of potential threat. I showed people various assorted baby animal pictures to see which embodied "vulnerability". The Penguin got the biggest "Awwww..." reaction. I added the red balloon just for good measure. 'MEAN STREETS'. 30cm x 20cm.